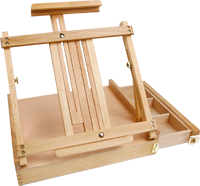 Lightweight large portable easel with non-skid rubber feet. Comes in handy carry case. Dimensions: 116cm wide x 87cm deep x 142cm high. Perfect for home where space is limited or for carrying to art class, fieldwork or the holiday bach/crib. Lightweight small portable easle with non-skid feet. Comes with a handy carry case. Dimensions: 76cm wide x 58cm deep x 120cm high. Oiled Beechwood table top easel with sliding drawer and carrying handle. Both up and down canvas supports are adjustable. Dimensions: 42cm wide x 36cm deep x 12cm high. A table easel that can handle larger canvasses. Height adjustable and can be adjusted to various angles. Dimensions: 45 cm x 52cm x 88cm. Lyre studio easel with adjustable mast angle. With ratchet for easy height adjustment. Stable A-frame adjustable rear support. Dimensions: 65cm wide x 99cm deep x 162cm high. Adjusts to horizontal for watercolours. Canvas height adjusted with a simple ratchet control. Locking screws give added stability. Dimensions: 67cm wide x 79cm deep x 213cm high. Professional tabletop easel. The two rear supports and centre column are adjustable. Dimensions: 34cm x 37cm x 80cm. Dimensions: 10cm high and 6.5cm wide at base. Maximum canvas height: 30cm or can be used to display photos, books, prints etc. Dimensions: 60 x 68 x 180cm. Elmwood table easel. Two rear supports and centre column are adjustable. Dimensions: 27cm wide x 32cm deep x 75cm high. Professional studio easel, centre column with ratchet. Adjustable angle with rear supports. Dimensions: 55cm wide x 55cm deep x 175cm high.